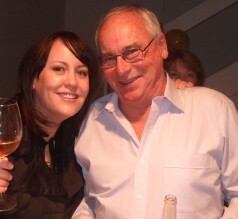 My Dad (pictured with me on the left) passed away in July 2010 from Mesothelioma, he was only 64. The funny thing is my Dad never worked with asbestos, he wasn’t a tradesperson or labourer, he worked in an office! My Dad was always very healthy, fit and very active – I can’t remember one instance where my Dad was sick. My Dad was originally from Scotland and migrated to Sydney when he was 21 – full of fun and excited about life and promises of a better future he couldn’t wait to get his life underway in his new home -Australia. He worked in various jobs in Sydney – one of them being an office job for a brake company in Sydney. Looking back he can now remember an open office plan – he recalled to us that his desk use to be covered in dust from the work shop where they would sand back the brakes. My Dad met my Mum in the late 60’s and whilst they fell in love – getting my Dad to commit and set a date for a wedding was proving to be a difficult task for my mum. Eventually she went to Canada to visit her sister, you know what they say “ distance makes the heart grow fonder”. And on her return – they set a date and were married shortly after. Here he is (right) with mum. Life bought Mum and Dad to Perth – where they eventually settled and had my sister Heather and two years later me. Life was good and we were all very happy. Heather and I grew up – normal happy girls, teenagers and eventually adults. We were very lucky and never had any tragedies in our family, deaths or any crisis’s. We were actually probably a little bit naïve to the world. 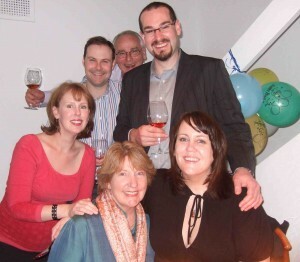 Here he is (left) with my family. Both our Grandma and Nan were still alive. And although Nan, my Dad’s mum was becoming weaker she was still as determined and independent as ever. Mum and Dad moved to Dunsborough to be closer to Nan, and eventually Grandma moved over from Sydney and also moved down to Busselton. My sister got married and had two boys Alexander and Cameron. I became engaged – the circle of life was turning and everyone was moving ahead in their lives. My Dad was a dedicated son – he and his Mum had a cantankerous relationship, she was cranky with him and he would be cranky back from the outside it would appear that they didn’t like each other at all, but they actually loved each other deeply. – He visited her everyday, looked after her garden, took her shopping and would do anything she asked. Nan eventually became too weak to look after herself – and agreed to move to a nursing home. Dad would drive the hour round trip to visit her each day – sometimes twice a day. That was my Dad – he never complained – and just accepted his lot in life and went about his business. He would help anyone – you only had to ask and he would be there. In October 2009 – my sister had her second baby – Cameron. My sister had a home birth and the next night Mum and Dad drove up from Dunsborough excited to meet the new addition to our family. After that weekend – Mum and Dad returned to Dunsborough – this is when Dad started to feel unwell. Dad being Dad he shook it off – went to bed with a “Hot Toddy” and tried to ignore the way he was feeling. After about a week , he still wasn’t getting better so went to the Doctors. He was admitted to hospital with Pneumonia and fluid on his lungs. I remember Mum ringing me – whilst I was concerned – I wasn’t overly worried as Dad was Dad, Invincible – nothing could stop him! When the fluid kept returning – that was when the Doctors became concerned. He was sent home – but scheduled for more tests. They thought it might be lung cancer – even though we were all worried – Lung Cancer can be cured – and us all knowing Dad and how determined he was – we weren’t overly concerned and all went about our lives. On the 1st December – Dad went to Bunbury Hospital to get the final test results. I remember this day like it was yesterday – as this was the day that changed all our lives. I was at work – excited that the year was nearly over… Christmas was on it’s way and we were looking forward to heading down to Dunsborough to spend some time with Mum and Dad. My phone rang – it was Mum, I knew she was ringing to give me Dad’s results – which I expected to be good news – eg it’s a mild form of Cancer which can be treated with a couple sessions of chemo. I could tell straight away by Mums voice something was wrong – “ It’s not good news she said – your Dad has been diagnosed with Mesothelioma” (I had no idea what Mesothelioma was – had never heard of it before) Next thing Mum broke down – “there is no cure Fiona – the doctor has given him 9-12 months to live”. I was in shock – and couldn’t believe what I was hearing…. I became very upset and was crying hysterically – I had to leave work –and drove quickly to my sisters… we both sat there in stunned silence… our world had been shattered. Heather’s phone rang – it was Dad – ringing to tell us that Nan had just passed away! Two blows in 1 day! Once we had gotten over the initial shock – we pulled together as a family and vowed to fight this nasty disease, “Google” became a daily occurrence and as I read about people surviving Mesothelioma for 5 years – my hope came back. Daily phone calls to my Dad to real off the latest thing I had found on the net. Examples – freshly squeezed juice every day- high levels of vitamin C etc etc. Looking back I was so blinded, and naive – I didn’t realise what a vicious black disease Mesothelioma actually was. Dad was put on a Chemo regime – and although we were told that it would not cure his disease, it would stop it from growing which was the best we could hope for at this stage. He was quite healthy – so if he could keep the disease at bay and contine life as usual well – we could deal with that! Dad started a list of things he wanted to do, buy a Triumph TR6, travel, travel overseas, go to Sydney and hire a yacht to sail on the harbour and watch the New Years fire works. Dad went through Chemo and he was so admirably brave… he never complained, never got angry – just took each day and was so strong. He never let us see how much pain he was in, and never let us see how upset he was. Eventually they stopped his Chemo as it wasn’t working. And that’s where we all lost hope again.It had been 2 weeks since Heather and I saw Dad.. we decided to go to Dunsborough by ourselves – without our partners to spend some quality time with Dad. It was then that we began to face facts – and realise this disgusting awful disease was going to get the better of our Dad. We arrived after our 3 hour drive to Dunsborough… Mum opened the door and as we walked inside Dad got up from the couch and walked over to the table – he was sweating, his skin colour was grey and he was puffing severely. He must of seen the shock on our faces – it was only 2 weeks ago we saw Dad and he had gone down hill dramatically in this time. Even then Dad was so strong and brave – that weekend was spent with us sitting next to Dad having big chats, he held it together while we both lost it and were frequently in tears. I was so angry – it’s not fair!Dad lost his fight to Mesothelioma 2 weeks later. He died at home with his family around him – which is what he wanted. My Dad was such a brave man – and fought this disease with all of his being – he always put his family first and never let on just how badly it was affecting him. Seven months after we buried Nan – we were back at the same Church, same Minister, same Cemetry burying our Dad. It was and is all still quite surreal. I can’t believe that in just 7 months our fit, healthy, strong Dad was taken from us. Mesothelioma is a disgusting disease that ruins lives and families. Like I said earlier – I had never heard of this disease before my Dad was diagnosed. We need to create more awareness to prevent this tragedy from happening to other families in years to come. During his sickness –with the help of the Asbestos Diseases Society – it was discovered that Dad was exposed to Asbestos when he worked in the office at the Brake Company. It just goes to show – that ANYONE can be inflicted by asbestos. Who would of thought just from working in an office that this could affect your life so dramatically. Thanks for letting me tell my family’s story.